This week, the National Memorial for Peace and Justice in Montgomery, Alabama, opens to the public, paying tribute to thousands of African Americans who were lynched by white mobs from the close of the 19th century Civil War through the 1960s. While lynching is most commonly associated with blacks in the southern United States, little attention has been paid to the lynching of other minorities, among them, Native Americans. “The definition that I and many scholars have used stipulates that there has to be an illegally-obtained death perpetrated by a mob -- three or more persons -- and that the collected killing must be in service to justice, race or tradition,” he said. The end of the Civil War in the U.S. triggered an uptick in mob violence as whites sought to assert power over African Americans freed from slavery. The Chicago Tribune newspaper, Tuskegee Institute (now University) sociologist Monroe Nathan Work and the National Association for the Advancement of Colored People began tracking lynchings in the late 1800s. Their work is the foundation of Monroe Work Today, an interactive map created by R.J. Ramey, founder of San Francisco-based Auut Studio. The map details racially-motivated mob violence between 1835 and 1964. In all, Ramey’s team pulled data from about 60 scholarly works. “We found hundreds more lynchings that had taken place that we didn’t know about,” he said. The project lists 4,800 individual lynchings by race or nationality; 137 are Native American. Sometimes settlers moved west faster than police and legal systems could be put in place. 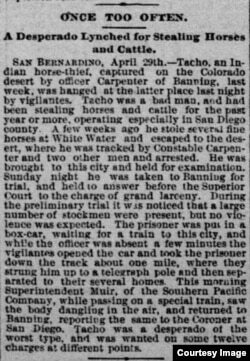 Clipping from Sacramento Daily Record Union, April 30, 1890, detailing lynching of Indian "Tacho." Courtesy, Library of Congress "Chronicling America" digital newspaper project. In April, 1890, an angry group of Banning, California, ranchers pulled a Native American man named Tacho from a boxcar at the local railroad depot, dragged him about a mile down the track and hanged him from a telegraph pole. Described by Sacramento’s Daily Record-Union as “a desperado of the worst type,” Tacho was alleged to have stolen a horse and cattle. In June 1848, a St. Croix Valley, Wisconsin, group of local businessmen conducted a “thorough, dispassionate and impartial” murder trial, according to the Wisconsin Tribune newspaper, of a 22-year-old Anishinaabe man known as Paunais or Little Saux, accused of murdering a white man. They hanged him in front of as many as 300 spectators, including his mother, brother, wife and several tribal leaders. 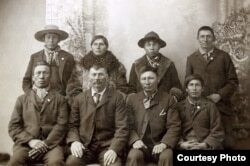 “The citizens are without a state or even a territorial government, with no courts or judges to hold them, and so frequent has been the case that Indian murderers of white men have gone unpunished that …citizens were determined to …show to the Chippeways [Anishinaabe] that their barbarous acts can no longer be committed with impunity,” read the paper's report. “There were also questions of complex legal jurisdiction between territorial law, federal law and sovereign indigenous law,” explained Pfeifer, that could lead to legal delays which frustrated angry citizens. 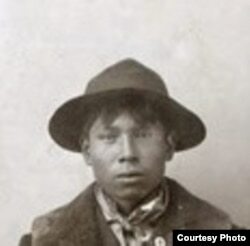 Paul Holytrack was only 19 years old when he was lynched for his suspected involvement in the 1897 murder of a white family in N.Dakota. Detail of larger photo, courtesy: Drapkin Collection. 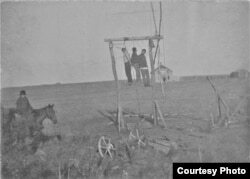 In November 1897, for example, masked men stormed a Williamsport, North Dakota, jail, dragged three Native American prisoners from their cells and hanged them from a nearby beef windlass — a device used to hoist cattle carcasses. Paul Holy Track, Alex Cadotte and Phillip Ireland had been implicated in the murder of a white family; after Cadotte was granted a retrial, citizens worried all three would go free. Some date back to the earliest colonial times: In July 1677, a group of women settlers in Marblehead, Massachusetts, beat to death and decapitated two Wampanoag Indian captives. Sometimes, said Pfeifer, the line between lynchings and massacres can be fine. “And some of this anti-Native violence can look like a lynching, but then shades into a massacre where multiple Natives are killed by white communities,” he explained.